What does it really mean to be enlightened? This is a question that’s been argued over for millennia. Who has experienced a real awakening, and who is simply trying to profit from the seeking of others? At very best we can come to a consensus on certain figures. 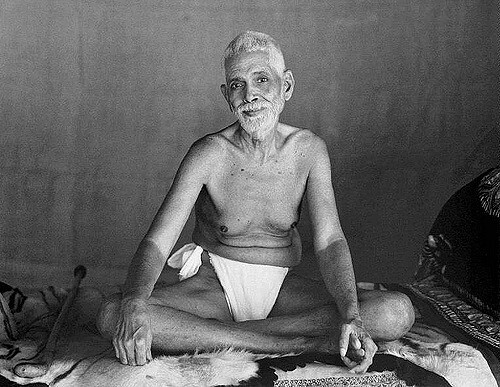 One of those beings was the 20th-century sage Ramana Maharshi, who was one of the first gurus to introduce the nondual teachings of Advaita Vedanta to the West. Born in 1879 in what is now Tiruchuli, Tamil Nadu in India, Maharshi had a strong death experience at age 16 that sparked in him an awakening that would impact an entire generation. Six weeks after the experience he moved to the holy mountain Arunachala, where he stayed until his death in 1950. Throughout his life, a community sprouted up around him as he was regarded by many as an enlightened being, and is now generally considered one of the most advanced sages of the last century. 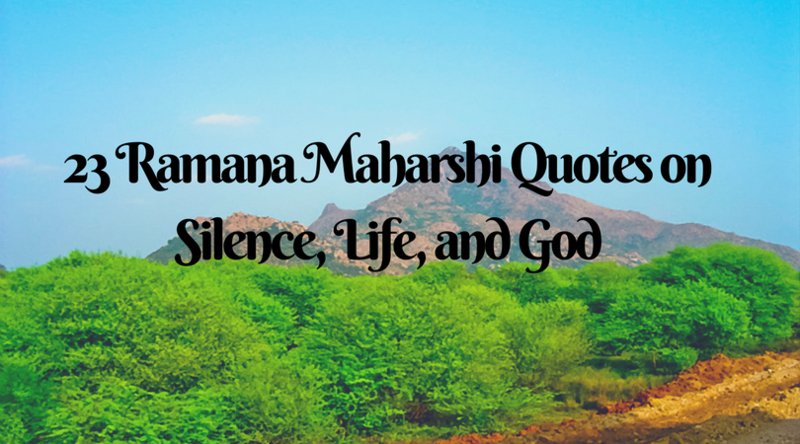 Because of the time in which Ramana Maharshi lived, there is a certain degree of mystery surrounding his life story. A strange man by our cultural standards, he sometimes spent years in complete silence throughout his life, only answering questions by drawing with a stick in the sand. In his early years, he would often meditate for hours through the attacks of ants, mosquitoes, and even scorpions. Ramana Maharshi mainly advocated the path of jnana yoga, which emphasise a method of self-inquiry. By constantly paying close attention to the feeling of ‘I’ and asking questions around that sensation, particularly ‘Who am I?’ and ‘To whom do these thoughts arise,’ he believed your ego would dissolve and you would become one with the infinite Self. Maharshis most famous discipline, Papaji, went on to influence the west and become teacher to some well know modern gurus such as Mooji and Gangaji. Note: In the following quotes, when Maharshi talks of the Self with a capital S, he is referring not to our idea of self, but to the infinite. Through his teachings, Ramana explained that to realize the truth of existence would be the best way you could give back to the world. Instead of trying to please everyone, he emphasised the importance of dissolving the ego and understanding the nature of Self. This, in turn, would lead you to act as an expression of the infinite, which would be spontaneous, loving, and more fruitful for your community than acting from the perspective of personhood. Happiness, as Maharshi explained it, was something that you essential were, not something that you had to attain. Through diligent self-inquiry, you would strip away the ideas that got in the way of your peaceful nature and contentment would become your permanent state. “Who said you couldn’t follow it? You can do so. But when you talk of love, there is duality, is there not – the person who loves and the entity called God who is loved? The individual is not seperate from God. Hence love means one has love towards one’s own Self. Stillness was a core motif throughout Ramana’s teachings. He saw the path of inquiry as leading to stillness and the perspective of stillness as leading to truth. The early years at his ashram saw him spending years meditating, often perfectly still in both body and mind. What experience have you had with self-inquiry? Let me know in the comments! Interestingly I have remembered those words with no effort word for word as exactly when they were first revealed to me whilst I was out walking with my dad and never repeated in that manner again! That’s interesting Bryan. It’s funny how some things get so effortlessly encoded in our memory! Probably an indication of their value.